A fruit salad with an orange and fresh mint marindate makes a perfect summer dish for outdoor parties. My facebook friends offered up suggestions on what they’d like to see this week and I was happy to take a few ideas and wrap my segment around them. A big part of many requests was summer dishes for a pool party, beach party, or picnic in the park (or while watching the Air & Water Show). So, still taking advantage of fresh seasonal produce, I created this fruit salad, summer salad and cucumber salad. All of these are portable, can be made in advance and are perfect on a buffet or picnic table. Feel free to substitute any fruits or vegetables in the salads depending on your taste or the freshness of what’s available in your market. If you’d like to use the watermelon as a serving bowl, slice a band across the top and then cut two wedges on either side of it. Remove the melon from the rind, leaving a thing layer of the red flesh still visible. Using a melon baller, cut 3 cups of melon balls, being careful to leave out the seeds. Place melon balls in a large bowl. Use the melon baller again to cut 2 cups of honeydew melon balls and combine them with the watermelon. Add strawberries, peaches, blueberries, pineapple and grapes. Set aside. Zest one orange and put the zest in a jar. Slice both oranges and squeeze the juice into the jar as well. Add sugar and balsamic vinegar and stir to dissolve the sugar. Add mint leaves and muddle them into the liquid (if you don’t have a muddler, press the leaves into the liquid with the back of a wooden spoon). Pour mixture over fruit and stir to combine. Refrigerate for 1 hour, stirring occasionally. 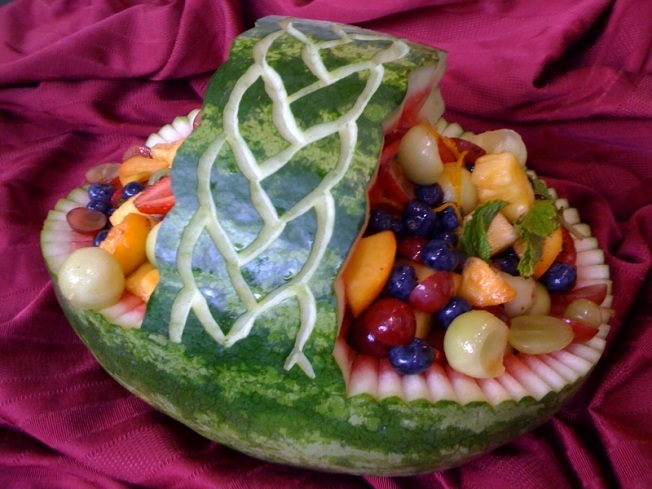 Spoon fruit into the watermelon bowl (or a large serving bowl) and pour the liquid on top. Garnish with additional mint. TIP: Place all of the unused melon into a blender and blend until smooth. Strain and enjoy the juice over ice or in a smoothie. Peel and thinly slice cucumbers and place them in a sealable container. Add pomegranate juice. Zest the lemon and add zest to cucumbers. Stir the mixture, seal the container and place it in the refrigerator for 4 hours. Meanwhile, slice the top and sides from the lemon. Cut the flesh of the lemon away from the membrane. Roughly chop the flesh and mix in the fresh dill. To serve, drain the cucumbers. Layer them on a flat serving platter in rows. Sprinkle lemon and dill mixture down the center. Fill a large pot with water. Add 1 tablespoon of salt and bring to a boil. Separately, fill a large bowl with water and add ice. Once water is boiling, drop in broccoli for about 1 1/2 minutes. Remove with a slotted spoon and place in ice water. Repeat with the asparagus pieces. Once broccoli and asparagus completely chilled, remove them from the water and drain. Pat pieces dry with paper towels and place in a large bowl. Add tomatoes, zucchini, feta and all but 1 tablespoon of basil. Toss to combine. Finely mince remaining basil and place in a medium sized bowl. Add vinegar and lemon juice and whisk together. While continuing to whisk, slowly pour in olive oil. To serve, pour dressing over vegetables and toss to combine. Season the salad with salt and pepper. These recipes combined ideas from my facebook friends Brett Janecek, Ryan Patterson, Lorrie Martinez, Laura Savage, Yvette Bijarro-Rodriguez, Laura McCarley and Ed Kaczmarek. Thanks to all these great folks for taking the time to offer up suggestions. There were a number of other great ideas that I’ll be using for segments in the fall. I can’t wait! If you have any questions or comments, please send me an email at wayne@waynesweekend or on twitter @MrDomesticDiva.